Stenhousemuir Football Club is pleased to announce that the Club will continue it’s partnership with RJM Sports for a minimum of another 2 years. 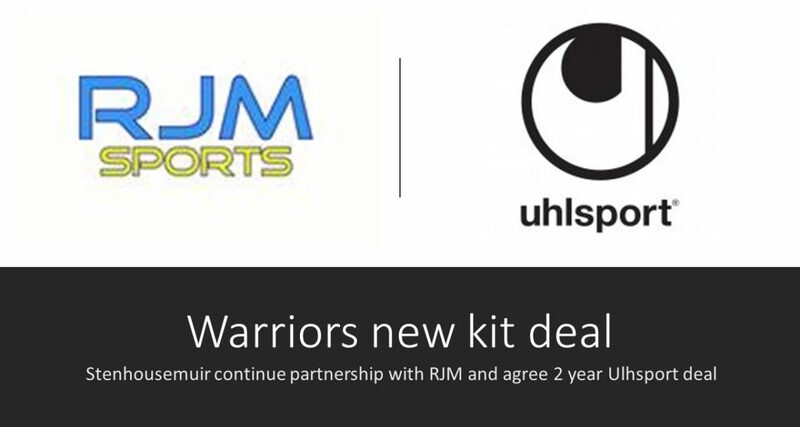 RJM Sports has been the official kit provider to the Warriors for the last few seasons and both parties were happy to extend the partnership. The locally based sports kit provider supply all first team strips, training attire and coaching kit as well as providing an excellent service for our Warriors in the Community members for all their training and match needs. Ulhsport will be the Club’s kit manufacturer during this period after the Club took the decision to move from Mitre. Uhlsport has been selected after discussions between the Club and RJM Sports and with Uhlsport meeting a number of key criteria. Perhaps the biggest advantage of moving to Uhlsport is the opportunity to create bespoke strips. The Club will be running a poll this week where we are asking supporters and our community to help us select the best strip from a number of designs. Follow the official Club Twitter channel to cast your vote. This seasons current home and away strips as well as some remaining Mitre stock will still be available to purchase via the RJM Sports website. The Club wishes to thank Mitre for backing the Warriors over the previous 2 years including the successful playoff winning season. A full new range of Ulhsport attire including the new Home and Away strips will be launched in the coming weeks and months.